Sandy’s Interview With Del. 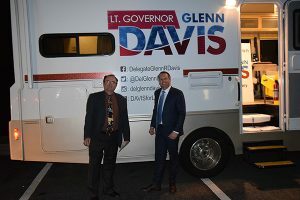 (and LG Candidate) Glenn Davis | Virginia Right! This was delayed for several reasons but here it is: My interview with Del. Glenn R. Davis, candidate for Lieutenant Governor. It was Greek to me until I read more about it. These nations were annexed by the evil empire in 1940 as part of the spoils of war with Germany. It seemed hopeless; the USSR was so powerful but not afraid to use that power to crush freedom. Finally God provided a miracle when the USSR was dissolved (thank the Lord Jesus!) and the three Baltic nations were finally independent nations once again (in 1991). So when I saw the article, I said – Hmmm – maybe this is a candidate with vision. And I was not disappointed. Davis seems to want to seek better regulatory and taxation strategies that will bring better, higher paying jobs in Virginia. Davis spoke to me about two weeks ago and we discussed his trip (at his own expense by the way) to the Baltic nation. Davis said that all business regulations must be done online and taxes take only five minutes to file! I added that Estonia has the e-residence business program and has even attracted Greek businessmen to the colder, more wintery Scandinavian nation! Davis advised me in Estonia they teach kids to do computer coding starting at the age of ten and this kind of educational reform is needed – school choice. He told John Fredericks that Estonian young people admire not ballplayers but entrepreneurs instead. Glenn catches the vision. 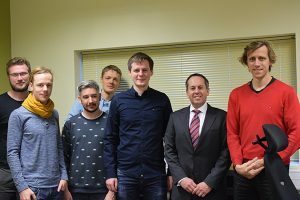 Here are several Estonians with Davis, including Ahti Heinla, a co-founder of Skype and is presently the CEO of Starship Technologies and several members of Heinla’s team. This company uses robots to deliver small items such as pizza delivery. Wants to improve the regulatory climate for small business (again I think a review of bills shows evidence of that – he got a bill passed that changed favorably the definition of household items for personal property tax purposes) perhaps no BPOL for two years of a business – only a $50 fee for the business license. Modernizing education to make it more relevant for students to get solid jobs without necessarily going to college. A. There is hereby established the Virginia Health Care Independence Bridge Program (“Bridge Program”) for the purpose of maximizing health care coverage of newly eligible adults by private managed care organizations and health plans. The Bridge Program shall be designed and implemented in a manner intended to (i) reduce the number of uninsured individuals in the Commonwealth; (ii) facilitate the transition of eligible individuals from the Commonwealth’s program of medical assistance services to private insurance to support financial independence and improve economic opportunity; (iii) reduce the cost to the Commonwealth of health care for indigent and uninsured individuals; (iv) improve access to quality health care services, including integrated, coordinated mental health services; (v) promote personal responsibility and accountability with regard to decisions related to health care spending and outcomes; and (vi) reduce fraud, waste, and abuse in the delivery of medical assistance services and health care in the Commonwealth. The program can expire and would expire on December 31 of 2016 (emphasis mine). E. The Bridge Program shall expire and coverage shall be canceled within 120 days of the earliest of (i) the effective date of any strategy to ensure access to quality health care services for newly eligible adults established by the Virginia Health Care Independence Innovation Plan pursuant to § 32.1-373, the General Assembly, or the Governor; (ii) any change in federal law or action of any federal agency that results in the federal medical assistance percentage made available to the Commonwealth for newly eligible adults that is less than the amount set forth in 42 U.S.C. § 1396d(y); (iii) any change in any waiver or other federal approval required to implement the Bridge Program that conflicts with the requirements of this section; or (iv) December 31, 2016. There is also an “Innovation Plan” that has a lot of health care language that I am not sure I understand. But it sounds like there are choices desired. So it is unfair to just say Del. Davis just wanted to expand Medicaid. He told me he was trying to find ways to keep the working poor from losing benefits right away when they earn too much money. Need some transitional benefits. Davis also advised me that six times he voted against traditional Medicaid expansion. I think Del. Davis is trying out something with more vision than the usual politician. I am not sure I’d have voted for this bill but I sense Glenn is open to new ideas. Davis told me – he does not want a title but rather wants to do something. I have not yet made an endorsement in either race but if I voted today it would be for Senator Wagner for Governor and Delegate Davis for LG. I am assuming that Del. Davis is not conservative. I will have some answers for this in a post coming up.